Technology has already created many new educational tools to help teachers improve learning in the classroom. One method uses video gaming elements to get students more interested and involved in the subjects they learn. 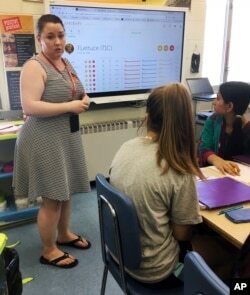 One American school using such technology is Dag Hammarskjold Middle School in Wallingford, Connecticut. On a recent afternoon, about 20 children at the school watched a computer screen at the front of the room. The students were taking part in an educational activity that looks a lot like popular internet video games like “Fortnite.” The schoolchildren compete in challenges and can collect points to unlock powers, clothing and pets for their players in the game. Unlike many video games, the students are not fighting against each other. Instead, the classroom games are being used by teachers to present different school subjects. The students can earn points as they pass through different educational levels of the game. Caiden McManus is a 13-year-old student at Dag Hammarskjold. He told the Associated Press he finds the game-based learning experience “a lot of fun.” He says working with pets is his favorite part because it helps him progress faster in the game. “To train the pets, you gain as many gold pieces as possible,” he said. Gianna Gurga is a teacher at Dag Hammarskjold. She told the AP she had been looking for new ways to get more out of her students. So she decided to try a classroom gaming system called Classcraft. She says she has seen student improvements since she began using the tool in 2017. Her results even led other teachers to start using the gaming system. With each correct answer, students receive points that can be used to buy things in the game. Points can also be exchanged for the chance to listen to music in class or take part in competitions against other classrooms. Students can also have points taken away if they behave badly. Student players can use their different powers within a game to cooperate so they have a better chance to succeed as a group. New York City middle school Quest to Learn was one of the first public schools to launch game-based learning when it opened 10 years ago. Researchers have followed the school in an effort to measure long-term results of educational gaming on students. In the last school year, 43 percent of Quest to Learn’s students met state requirements for students tested in English. This compared to 41 percent of students across the whole city. Twenty-nine percent of the school’s students met state requirements after being tested in math. This was lower than the 33 percent citywide who met the state math requirements. But supporters of game-based learning say testing alone should not be used as the only measure of student results. Ross Flatt is director of programs and partnerships for the not-for-profit group Institute of Play. The group uses game design elements to develop new learning experiences. It says outside studies have shown that students taking part in educational gaming do show growth in important areas. The main areas of improvement include student cooperation with each other, creative thinking and empathy, the group said. The Associated Press wrote this story for VOA Leaning English, based on reports from the Associated Press and online sources. Hai Do was the editor.